It goes without saying that the wine industry attracts a great number of bright, creative, talented, hard-working people, from all walks of life. But beyond that, there are some who just stand out as exceptional human beings. Though I do not know them well, Leonard and Leslie Brown simply radiate kindness, compassion and competence. A year or so ago, they came up from Milton Freewater, where they farm 1100 acres of apples, 100 acres of wine grapes, and are partners in Watermill winery and the Blue Mountain Cider Company. They wanted to show me a new wine, a personal project, called Ellanelle. I remember tasting and liking the wine, but for whatever reason, we agreed that this first release would just be quietly marketed and not “officially” reviewed. The 2009 Ellanelle (L and L you see?) Cabernet Sauvignon is about to be released. It’s blended with 4% each Cabernet Franc and Merlot, then aged in 80% new oak. Still as fresh as any young red wine can be, it charms immediately with a lovely, sweetly floral nose and luscious, berry fruit flavors. Yes, there is plenty of toasty oak goodness, but it’s layered in with the fruit and soil flavors. Overall, this is a thoroughly enjoyable bottle right now, with a good decade or more of aging potential. The Browns have a well-constructed website with excellent information about their family histories, their vineyards, and the specific soils from which the Ellanelle grapes are drawn. One vineyard – Windrow – includes some of the first vines planted in the Walla Walla AVA in the modern era. 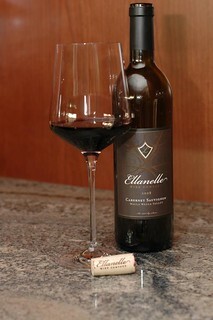 Its owners, Doug and Jan Roskelley, who make wines under the Tero label, came up with the name Ellanelle. This wine is the only wine the Browns make under their personal label. There are 185 cases of the 2009, and just a handful of cases left of the 2008. Both vintages are very fairly priced at $35/bottle. I shared the wine with visiting friends who tasted it among a selection of very fine, more expensive red wines, and picked it out as one of the two favorites of the night. I checked the website and there is no purchase information up yet for the 2009, but it will be released shortly and the Browns assured me that it may be pre-ordered right now. I am confident that you will find it absolutely delightful and a rare find that few wine lovers will ever have a chance to enjoy. Thanks Paul. We are excited about the 2009 release. We updated the website with the 2009 release and purchase information. We have tastings once a month at a local boutique chocolate shop, Petits Noirs (www.petitsnoirs.com) and per scheduled pickups by phone or email. We ship directly in Oregon and California and sell retail only in Washington.